116 min. Focus Features. Director: Tom Ford. Cast: Amy Adams, Jake Gyllenhaal, Michael Shannon, Aaron Taylor-Johnson, Armie Hammer, Laura Linney. The bad breakup of a relationship, even one without violence, may not rise to the intense level of PTSD, but the lingering effects can tenaciously haunt a person. That’s the central conceit of Nocturnal Animals, a moody and deeply unsettling look at a pair of failed relationships, regrets and recriminations, and measures of emotional violence—oh, shall we call it “lashing out”?—symbolized in physical violence. For his sophomore cinematic effort, writer-director Tom Ford (A Single Man) adapts Austin Wright's critically acclaimed novel Tony and Susan. Following that novel’s lines fairly closely, Ford introduces us to trendy L.A. art gallery owner Susan Morrow (a nuanced Amy Adams). In her husband Hutton (Armie Hammer), she has “appropriate” arm candy but a lack of emotional satisfaction, and he clearly feels the same. Following a boffo opening of pretentious art (whose meaning seems to be the last concern of anyone, gallery employees or guests), Susan receives a manuscript from her ex-husband Edward Sheffield (Jake Gyllenhaal, tender and searing in turns). When Susan sits down to read the novel—entitled “Nocturnal Animals” and dedicated to Susan—Ford shows us its contents, as Susan experiences them in her mind. This story within a story concerns a family on a road trip through West Texas: marrieds Tony (played, pointedly, by Gyllenhaal) and Laura Hastings (Isla Fisher), and their teenage daughter India (Ellie Bamber). On a two lane-highway, by dead of night, the family encounters a gang of toughs, led by psychopathic Ray (Aaron Taylor-Johnson). The next day, Detective Bobby Andes (Michael Shannon, again blindingly brilliant) turns up to help locate the gang and make them pay for what they have done. This manuscript clearly presses buttons for Susan, who begins sifting through the evidence of her own failed marriage to Edward. Ford’s Nocturnal Animals, then, is also about art: when it means something and matters, where its wellsprings are located, and its potential to provoke reflection, enlighten, and sting. The intersection of Susan's antiseptic, lonely universe and Tony's dirty, cruel one makes for strong visual and emotional contrasts, and Ford's tracking of Adams' immediate and delayed reactions to what she reads parallel the audience's own troubled parsing of what were seeing from both "Nocturnal Animals" and Nocturnal Animals. Parallels also emerge between the manuscript and real life, such as the class tensions between the Hastings (in their old Mercedes) and the criminals they encounter, who behave not unlike the toothless backwoods-ers of Deliverance. In real life, Susan’s every-hair-in-place matriarch (“mother” seems insufficient), played by Laura Linney, looks down her nose at Edward for having a financially irresponsible dream of pursuing writing, and plants that fear in her daughter. In our real life, Tony and Susan’s initial mass-market paperback edition sold poorly, assumptively (according to its original publisher) because it was “too literary.” With his mass-media adaptation, Ford may have better luck. Certainly, he has given audiences that rare post-milennial film that demands post-game discussion. 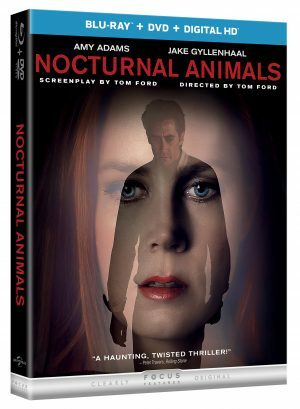 Universal's Blu-ray + DVD + Digital HD special edition of Nocturnal Animals is a beaut in the A/V department, although skimpy on the bonus features. Ford's lush visuals get an ideal treatment in this richly colorful and highly detailed HD transfer. I wasn't expecting the film to look this good (partly because I first viewed the film not in a theater but on a standard-definition screener DVD), since the film largely takes place at night. But the nighttime exteriors hold up as well as the glossy interiors and sunbaked exteriors for a consistently sharp HD picture. A deep, deep black level proves crucial and contributes to the overall sense of depth yielded by the transfer. The DTS-HD Master Audio 5.1 mix kicks things up a notch during the intense highway sequence and when there's a bit of gunfire (both also benefit from punchy LFE), but mostly, this is a soundtrack marked by clearly prioritized front-and-center dialogue and richly realized music cues. Bonus features amount to one three-part featurette that clocks in at around eleven and a half minutes. "The Making of Nocturnal Animals" comprises "Building the Story" (4:10, HD), which examines the interwoven narratives and characters; "The Look of Nocturnal Animals" (3:47, HD), honing in on Seamus McGarvey's cinematograpy and Arianne Phillips' costume design; and "The Filmmaker’s Eye: Tom Ford" (3:32, HD), which touches on the film's ending as well as Ford's "eye" for detail. Writer/director Ford and stars Amy Adams and Jake Gyllenhaal are among the interview participants. All site content © 2000-2019 Peter Canavese. Page generated at 04/18/2019 02:01:00AM.